On December 31, 1900, during a special night of prayer before the Eucharist, the young seminarian James Alberione felt himself called to serve God and the people of the new century. During that night, he resolved to do something new and wonderful for the Church of Twentieth Century. At the time, many were complaining about the "evils" of the bad "press" and slowly an idea arose in his fertile mind that the press should be utilized for good and the human spirit nurtured by the truth and wisdom of the Gospel. From then on, this invitation transformed and gave specific direction to his future life as a priest, apostle, and communicator of Christ. Following his ordination to the priesthood, his call gradually became clearer, and a group of young boys under his direction began, publishing the the diocesan newspaper in Alba, Gazzette d'Alba, to use the press to spread the gospel. Thus in 1914 was born the Society of St. Paul. A year later, he founded a similar group for women, the Daughters of St. Paul. His ideal, like that of St. Paul, was universal – all the means of modern communications were to be used so that all people would hear the gospel. For this extraordinary mission, new apostles were needed (both men and women), who could dedicate themselves entirely to this service. By the time of his death in 1971, Fr. James Alberione had founded ten institutes that are known today as the Pauline family. On December 20, 2002, Pope John Paul II promulgated the decree for the beatification of Fr. James Alberione. His beatification took place on April 27, 2003 at St Peter’s Square in Rome. our sanctification and in our apostolate. Mother and Queen of the Apostles. Grant me the grace I am praying for…. Jesus Master, the Way, the Truth and the Life, have mercy on us. Mary, Queen of the Apostles, pray for us. From all sin, deliver us O Lord. Those who obtain graces and favours through the intercession of Blessed James Alberione, are kindly asked to contact us. "How many times have you considered the question: "Where is humanity going? How is it going? Toward what goal is humanity headed? This humanity that is continually renewing itself on the face of the earth?" "
Teresa Merlo met Fr. Alberione June 27, 1915, and agreed to collaborate with him in giving life to his apostolic vision. From that time on, with tremendous faith and untiring trust, Teresa, who took the religious name of Thecla, (after St. Paul's first woman disciple) assisted him not only in the foundation and formation of the Daughters of St. Paul, but with the other Congregations of the Pauline Family and his many other apostolic works. Her deep faith and trust in God, her example and courage, her close collaboration with Alberione and her loving guidance of the sisters won for her the respect and love of all who knew her. She helped shape the particular spirit and new mission of the Daughters of St Paul dedicated to evangelization with all the means technology would provide. 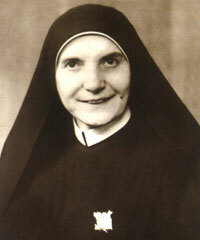 She died on February 5, 1964, and the Church proclaimed her "Venerable" on January 22, 1991. Most holy Trinity, Father, Son and Holy Spirit, we thank You for having, created, redeemed and sanctified Your humble and faithful servant, Sister Thecla Merlo and for having constituted her Mother and Co-Foundress of the Daughters of St. Paul who are consecrated to the apostolate of the Mass Media of Communication. Deign now to glorify her even here on earth, granting us, through her intercession the grace we ask of You…. O Mary, Mother, Teacher and Queen of the Apostles, support our plea with your maternal intercession. Amen. Those who obtain graces and favours through the intercession of Sister Thecla Merlo are kindly asked to contact us. Blessed Timothy Giaccardo, the first member of the Pauline Family to be raised to the altars, has a special place in each Pauline's heart. As a young boy, Fr. Alberione picked him out and sent him to the seminary. Eventually he became not only Alberione's right hand and a primary figure in the interpretation of the Pauline charism, he was in a special way instrumental in the life of the congregation of the Pious Disciples of the Divine Master, the third community founded by Alberione. 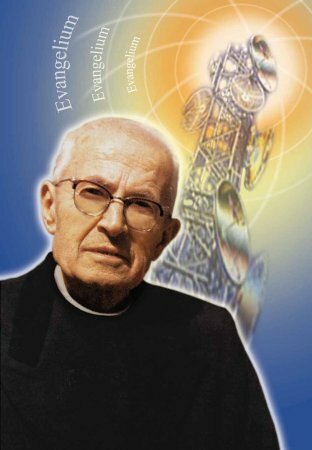 On May 9, 1985, Pope John Paul II declared Father Timothy Giaccardo "venerable." The story of the Daughters of St Paul runs parallel to the story of the extraordinary development of the media in the 20th century, and to the story of the Church in this period. It began in Northern Italy in 1915, when Fr James Alberione first gathered around him a small group of young women and girls whom he prepared to carry out the printing apostolate. He asked Sr Teresa Merlo to be our first Superior General. These two were remarkable leaders and it was through their faith and guidance that we received firm foundations and continued to grow. Our congregation started out by printing and distributing Bibles and catechisms at a time when the Bible was not well known, nor its prayerful study encouraged among Catholics. The editorial and publishing aspect of our ministry quickly developed and soon afterwards our radio ministry evolved. In time we opened book centres so that people could easily find good Christian reading material and resources. The criteria for choice of content were always made with the view to promote the human and spiritual growth of the person. In the early 1930s the Sisters began to move out from Italy so that, following the example of St. Paul, we could continue our mission in every corner of the earth. Today, our sisters can be found on five continents and in 50 nations with a total of 260 communities worldwide. The Pauline Institute has 2,560 members and about 300 young women in formation. This international aspect of our Institute encourages a great love and respect for the diversity among cultures, and an emphasis on inculturation. Over the years our ministry has continued to develop and change as society has changed. Our founder encouraged us to learn and make use of the new forms of media as they emerged. This spirit of change and adaptability is essential to the character of our Institute. It gives us a very positive outlook on the future, and the courage to welcome the challenge of speaking about God in new ways to the people of each new generation. © & ℗ 2012 Paulines Singapore . Powered by Blogger.